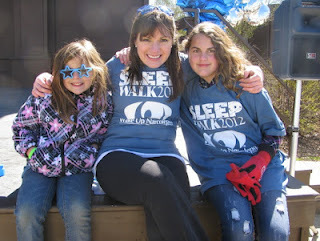 The week of SLEEP WALK 2012, I checked the weather obsessively like a bridezilla awaiting her wedding day. Hosting a “rain or shine” event outdoors in March is precarious. It could snow; it could be summer. Arriving at the National Mall early Saturday morning – the sun was shining brightly, not a cloud in the brilliant blue sky. However, the temperature was uncharacteristically cold – in the low 30’s. A brutal wind cut across my face as I stepped out of my car. “Oh no. Will anyone show up?” I wondered. I knew my friend Gail would show up. Actually, she beat me there – with the tables, chairs and snacks in her car. 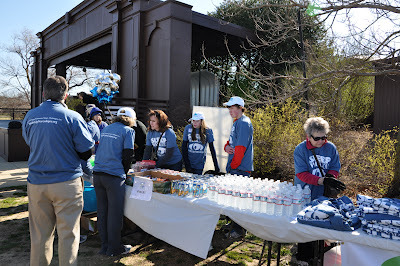 As we began unpacking, other volunteers and participants began arriving. Everyone pitched in – it was a team effort. Over the next few hours – people continued to arrive. 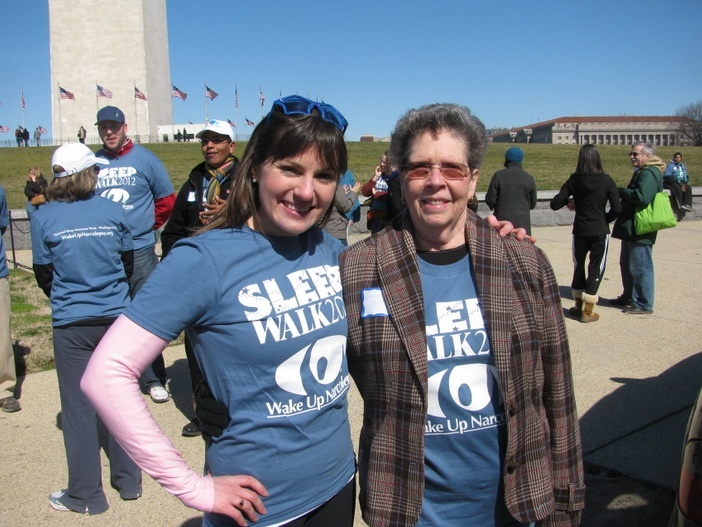 Attendants included those with sleep disorders, sleep experts, researchers and supporters. We even had two canine supporters! 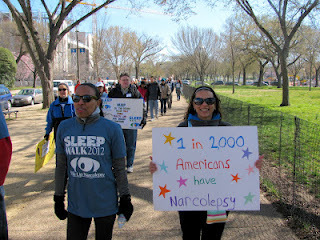 For a full re-cap – visit Wake Up Narcolepsy’s blog. A few personal highlights – I got to meet the Cavnar family, whom I’d featured on my blog last summer. Meeting Diantha, Haven and Seanna felt like re-uniting with old pals! The creative signage was amazing – thanks to Cindy, Rachel, Mark, Deborah, Kerry, Sue, Jennifer, Sze-Ping and Diantha. Next year’s Spirit Contest will also have a costume category – as suggested by a few sleepwalkers decked out in festive sleep gear! 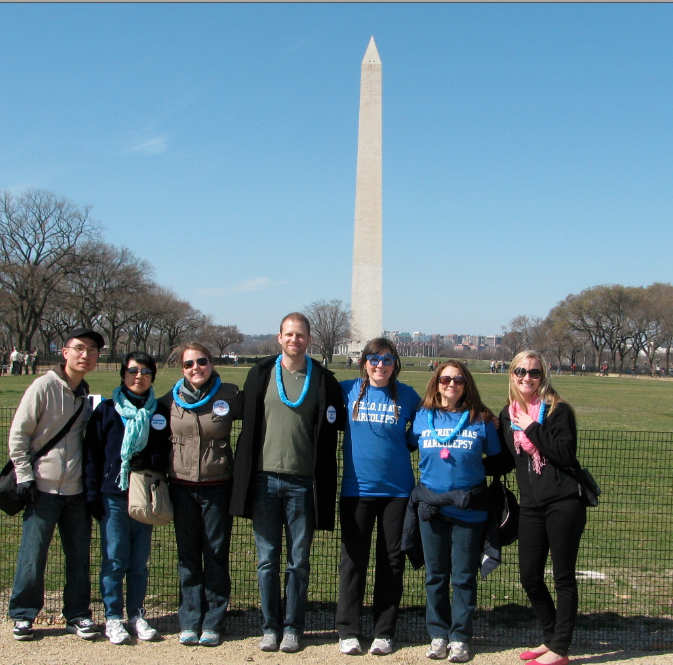 For some people with narcolepsy, this was a first opportunity to meet someone else with narcolepsy. I’m so honored the SLEEP WALK provided a positively spirited environment for people to connect. Despite the chilling weather, smiles were plentiful. We stood tall, we held posters, we danced, we laughed, and we walked proudly. 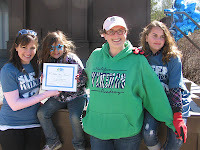 Last year, seven people attended SLEEP WALK 2011. This year, 113 people attended! I hope the movement continues to grow – in size and locations. If you are interested in organizing a SLEEP WALK in your community, please contact me for more information! When I returned home from the walk Saturday afternoon, I made myself lunch in solitude. Moments from the morning replayed in my head. I saw myself on the stage looking out at smiling faces and blue t-shirts. 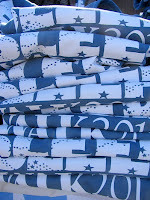 And I saw my Dad, standing on the grassy hill just above the others – in a matching blue shirt and Wake Up Narcolepsy cap. He would’ve loved the new caps. Tears gushed down my face, happy/sad tears knowing he was there too, cheering us on too. Many gathered in person. More were there in spirit. Thank you to all those who’ve supported my efforts – wherever you are! 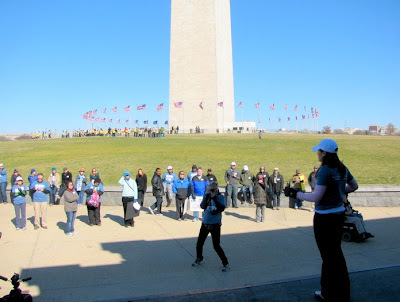 I dreamed of an awareness walk like this “some day.” I never imagined some day would come so soon. It’s surreal and all I can say is thank you. 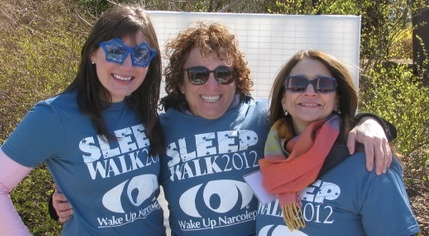 A big thank you to the Wake Up Narcolepsy team for making this dream a reality. WUN’s support was invaluable. Thank you to Steve for taking hundreds of photos. 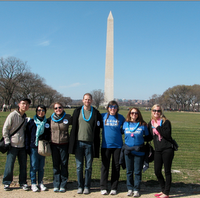 Thank you to Gail, David, Sze-Ping and Carlyn – two years in a row and counting! For a full re-cap of the SLEEP WALK 2012 – visit Wake Up Narcolepsy’s blog. 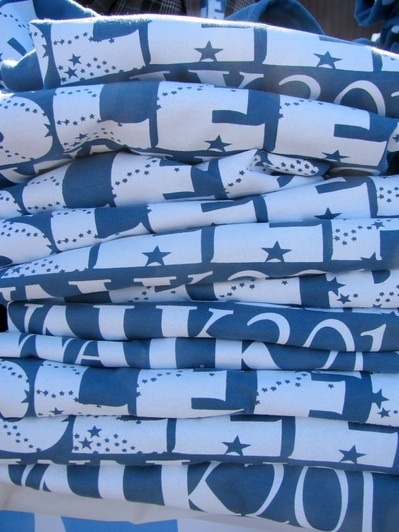 Stay tuned for a special blog post highlighting the Nia Warm Up of SLEEP WALK 2012…. Congratulations on seeing your dream become such an incredible success so quickly! I am really proud of you! Julie, it was an honor to be involved is such an important event. Thank you for always being so positive. You are always so optimistic and it really helped my son to be around you this weekend. Thank you for being YOU! What a success on what looks like a beautiful day! 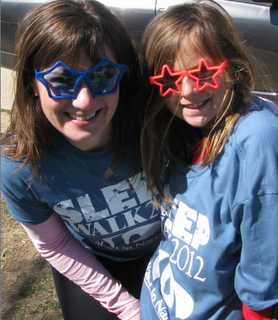 Congratulations Julie and all involved in the Sleep Walk. Hmmm, I might have to plan to travel to one some time…. 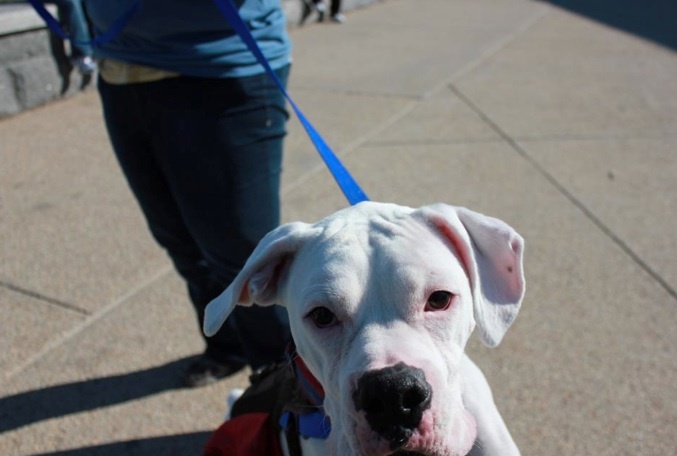 I had so much fun on the walk! I'm looking forward to doing it again next year!! Already looking forward to next year! You did a fabulous ob organizing and keeping us all focused. It was wonderful meeting and talking with everyone. 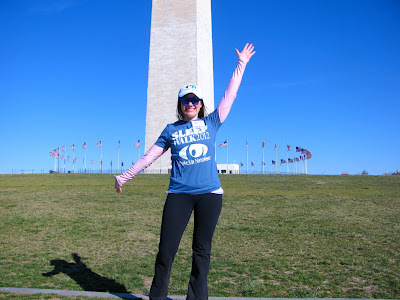 You are doing a fantastic job of raising awareness of Narcolepsy!